Go to any Metropolitan Bank and Trust Co. (MBTC) Branch to enroll your Globe, Sun or Smart phone in Mobile Banking. 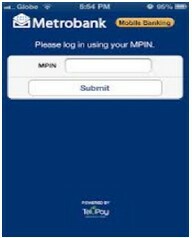 Once enrolled, download the Metrobank Mobile Banking application available for Android (Google Play Store) and IOS (Apple Store) users. To facilitate payment to Cignal TV Inc., select Pay Bill. Select Cable > CIGNAL TV INC. Select the Metrobank Account Number where the payment will be debited. Enter the Members ID Number (Cignal TV Account Number). Click here to know your account number. Key in the MPIN to confirm the transaction. SMS Confirmation on the status of payment will be sent to the enrolled mobile number. Save the message for future reference.